When I began this blog a couple of years ago, my intention was to use it as a means of sharing with others the joy of being a priest. Not only did I hope that some young man might read it and be moved to answer the call to a priestly vocation, but I also hoped to provide laypeople a window into the life of a priest. Happily, I think both of those goals have been accomplished. I suppose that I also had hoped to communicate through the written word the beauty of the Catholic life as it is lived and experienced in the life of a great parish, and now in the life of university students at the BU Catholic Center. As a priest, I constantly witness extraordinary examples of Christian discipleship in the lives of the lay people around me and in the lives of the priests with whom I serve. In this blog, I've tried to highlight the lives of these people, so that others might be encouraged in living the life of a disciple. I had intended this blog to be a place of encounter. I hope that those who have followed it have somehow encountered Christ and drawn closer to Him. In recent months, it has become clear to me that the present moment is less a time for me to share my experience with you, and more a moment to share my experience with God in prayer. These things are not necessarily mutually exclusive. Sometimes, however, it is good for a priest to withdraw and ponder in silence. Of the many positive things I've witnessed among the young people at the BU Catholic Center, the one thing that has most struck me is their devotion to prayer. So, because of their example, I've decided to pray more and write less. November seems like an opportune season to reflect, so I'm taking a month's retreat from blogging. It's an awesome thing, isn't it? We all have the opportunity to take time in our life to converse with The Lord. 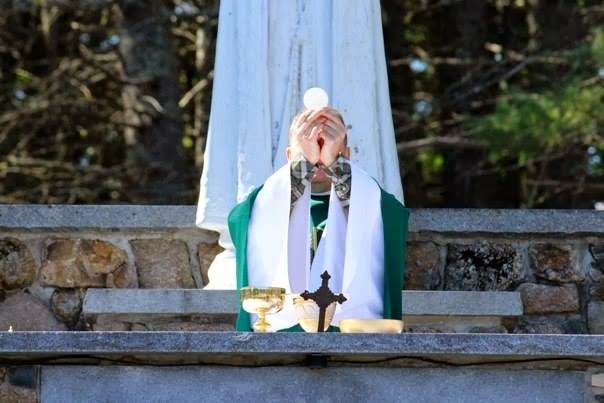 Priests are to be men of prayer. Pray that during this month, I become more a man of prayer. And, of course, I will be praying for you too. See you in Advent. God Bless. Sometimes when I would walk around the church of my former parish, I would think how awesome it must have been to be the pastor who built that church. It is a magnificent and beautiful structure. He and his parishioners built something that generations later still causes awe. To their credit, the priests who were there over the years never did any real damage to the original building. Sure, there were some innovations during the 1970's, but none of them destroyed the beauty of that church. The other thing that was obvious from being pastor there was that the people of that parish had been well-served over the course of time. They were a devout people and a faithful people. Sometimes, it is obvious when you walk into a Catholic community that the community has suffered a long time from poor liturgical practice, weak formation, and unsound doctrine. The results are abundantly evident in all aspects of the community's life. And, making changes can require a herculean effort. A few months ago, I began work at the Newman House at Boston University. All of the time, I find myself filled with gratitude for the people who have shaped this place for the past decade or so. The evidence of their hard work is visible everywhere. The young people who populate the Newman House, first of all, know how to pray. I am always moved to hear them begin or end a meeting with a very beautiful and personalized prayer. It is clear when one of them prays aloud that he or she is somebody who is experienced in prayer. This is just so beautiful. The only way that the young people there know how to pray is because the Newman House has a culture of prayer. Over the course of time, people there learned how to pray and then taught others by their example. They are devoted to the Mass and to the Sacraments. When you are at Mass with these young people, you know that they believe. Again, this is because over the course of time, they have been educated and formed in the sacramental life of the Church. There is a sacramental culture. They not only pray together, but they sing together, read the scriptures together, and discuss the Faith with each other. They live a friendship together. This friendship is rooted in Christ and is clearly the work of good formation. It is all very beautiful. Not only are these young people the recipients of what was previously built up at the Newman Center, but they are also the beneficiaries of strong Catholic upbringings in their families and in their home parishes. Our goal, of course, at the Newman House is to draw in EVERYBODY to life in Christ and His Church. But, not everyone who comes to the Newman House is new to the Catholic life. Many of these young people have already received strong formation from their parents and from their parish priests and youth ministers. Sometimes in the life of the Church, a priest arrives to find a mess and has to set about cleaning it up. And, truth to be told, we priests like to tell war stories. We like to be the guy who saved it all. But, this time around, I showed up at a place where I have to be grateful for the spiritual leadership that preceded me. Any priest who walked into this place could clearly tell that good spiritual formation has deep roots here. Sure, there are probably things that I will change along the way and things that I might do differently. But, those are all small things. In a place where Catholic Faith is weak, the small things become major things. In a place where Catholic Faith is strong, the small things take care of themselves over time. So, what's the real point of this rambling blogpost? The real point is that sometimes, we plant and another reaps. But, right now, I'm reaping where others have planted. What makes this place so extraordinary? In so many ways, what makes this place so strong is that many others have worked hard over the years. Someone took the time to teach people how to pray. Someone took time to teach people the importance of confession. Someone took time to witness to Christ. Someone exemplified true friendship. 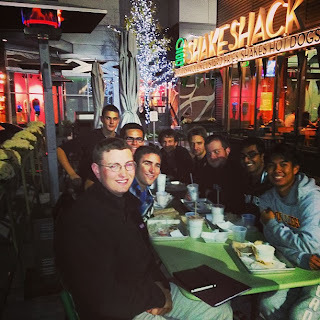 These "someones" were priests and religious (both at the Newman House and in the home parishes of the students here), parents, fellow students, interns, and FOCUS Missionaries. All of these people worked hard and built something over the course of time. Now, I show up and am grateful that these people all took seriously their mission. Because they lived the mission that God had given to them, I get to witness something very beautiful. If we are faithful to what Christ entrusts to us, we have to trust that He will use it to create an abundant harvest. To all who are faithful workers, I'm grateful to you. I'm the recipient of your labors. And, for those who might feel overwhelmed by your mission or dissatisfied by your mission, I just want to encourage you. Doing what Jesus asks, bears fruit. I'm surrounded by a great harvest that grew through the dedication and fidelity of others. We often think about seminary as the place where men go "to learn how to be priests." But, it is in the living out of priesthood that we really learn how to be priests. It is in being a priest that one is conformed more and more to the priestly heart of Christ. In the Rite of Ordination, the bishop places the chalice and paten into the hands of the newly ordained priest and he says, "Accept from the holy people of God the gifts to be offered to Him. Know what you are doing, and imitate the mystery you celebrate: model your life on the mystery of the Lord's Cross." It is through the daily offering of the eternal sacrifice of Christ, that the priest is drawn more and more intimately into the victimhood of Christ. This does not happen automatically. It requires the priest to unite himself to the sacrifice. This is why the words spoken take on the form of an instruction or an admonition: "Model your life on the mystery of the Lord's Cross." In every Mass, the priest offers to the Father in an unbloody manner the sacrifice that took place on Calvary. All that was in Christ's heart, all that Christ endured in that sacrifice, is offered in every Mass. On the day of his ordination, the priest was told to "imitate the mystery you celebrate." On the day of ordination, few of us probably had any idea what this meant! Well, we probably knew what it meant theoretically, but it is in the daily living out of this command that it truly is made known to us. Nearness to the Sacred Mysteries is nearness to the Cross. St. Paul instructed Timothy to "bear your share of hardship for the Gospel with the strength that comes from God" (2Tim 1:8). This instruction is not moralism. Instead, we see a fraternal and fatherly tenderness. St. Paul writes to Timothy in order to strengthen him in his pastoral ministry. In doing so, St. Paul provides to priests and bishops a model for priestly fraternity. St. Paul teaches from his own experience of suffering for the sake of the Gospel and he speaks with tenderness for Timothy. Among the beautiful gifts that God gives to a priest when he is ordained is the fraternity of the presbyterate. The individual priest learns from their example, benefits from their experience, and is encouraged by their fraternal charity. The more a priest conforms his life to the mysteries he celebrates, the more he becomes a truer brother to his fellow priests. I've been privileged in my life to be surrounded by priests who imitate what they celebrate. This willingness on their part to be conformed to the Sacrifice of Calvary gives them hearts that are filled with the tenderness of the shepherd who lays down his life for the sheep. On the day of my ordination, I knew that those things that were spoken to me were serious business. These things have to do with the salvation of souls--mine included! In true priestly friendship, we help each other to take seriously our call to be stewards of the mysteries of God. In priestly friendship, we help each other to be shepherds after the heart of Christ. Priestly fraternity is of no use unless it helps the individual priest to become more like Christ, the one, true priest. True priestly friendship helps the priest to grow in pastoral charity; a charity that offers everything for the sake of the flock. This week, I found myself continuously moved by the example of various priests that I know. Some are much older than I am. Some are my age or younger. In various ways, perhaps unknown to them, their life shows forth the tenderness of a shepherd's heart; a tenderness that comes from conformity to the mysteries that they celebrate. Their priestly example and fraternity renews in me a desire to follow Christ and to imitate him. When Jesus sent out his disciples, he provided a list of things that they should not bring with them. But, among the limited things that he did allow them to bring was each other. He sent them out two by two. I've always thought that the reason Jesus did this was to show forth the power of Christian friendship. "Where two or three are gathered in my name, there I am." The effective tool of drawing others into the Kingdom was the love between the two disciples. When people see how Christians love one another, it attracts them and convinces them. In the past couple of years, many things have been written about evangelization in the Catholic Church. Some provide helpful hints about utilizing social media and population charts. Others provide "best practices" from other churches. Some discuss pastoral planning as though it were the key to evangelization. Some articles and books attempt to provide a "how to" manual. Some of these things may well be helpful in evangelization, but if we're not careful, we may find ourselves lugging a sack full of books and articles about evangelization instead of being attentive to Christian friendship. What are we doing to strengthen the bond of charity among ourselves? It seems that if any true evangelization is going to take place, it will do so because of a growth in charity among believers. Charity isn't vague. It is personal. Evangelization is always personal. It is about encountering Christ's love, and his love is not theoretical. The human heart--my heart--desires meaning, desires mercy, desires to experience an infinite love. But, it does not desire to experience these things in some sort of theoretical way. The heart longs to be looked upon with a personal gaze; a gaze that loves. Evangelization is an encounter. It is not a commercial or a sales pitch. It is to look upon another with the gaze of Christ. This gaze introduces something new into the world. Evangelization depends upon friendship. Pope Francis is teaching this all over the place. Despite how it was characterized, Pope Francis didn't decide to forgo the papal apartments because they were too fancy. He chose to live elsewhere because he wants to be around people. Pope Francis doesn't just say that "shepherds should take on the smell of the sheep." He actually lives out his words. He wants to be around people. There is a danger among bishops and priests that we become isolated from the people. We can live remote from them. As we think about the importance of evangelization, I think we need to think firstly about charity. 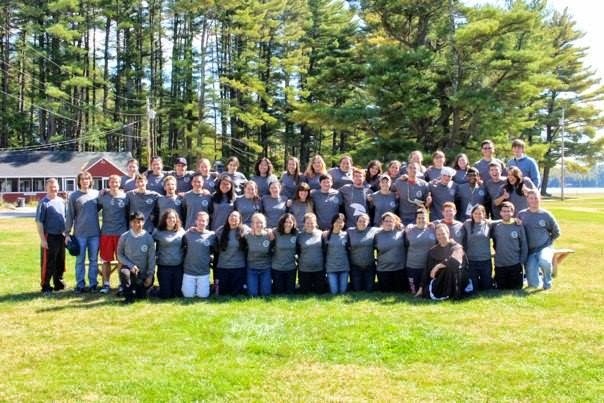 How are we growing in charity? Are bishops close to their priests? Do they love their priests? Or, are they remote from their priests? Do people see an attractive bond that exists between bishops and priests? Are priests living in fraternal charity together? Do people look at their priests and see models of friendship? Do people see priests loving one another and helping one another to live lives of holiness? Are priests close to their people or do they live priesthood like a job? Do priests love their people? Does the parish priest live among the people? Does he know his people and visit their homes? Or, is he remote and treat priesthood like a profession? Are parishes (and, in my instance, a Newman House) places where people learn how to live Christian friendships? Do we love the disciple at our side? Is the way we love one another a point of attraction for others? This may sound like a harsh criticism (in which I include myself), but perhaps the real problem that we need to address is our lack of charity. While Pope Francis is busy about reorganizing Vatican departments, his real work seems to be in getting out and being close to people. When we see a politician kissing a baby or visiting a homeless shelter, the cynic in us thinks, "He's trying to get votes." But, Pope Francis already got his votes and he's not up for re-election. He, I think, is trying to teach all of us that evangelization is about charity. We can pack a few extra books, a couple of mission statements, a website, a google calendar, a pastoral plan, and an extra cloak and call it a day. But, Jesus didn't tell us to pack all of that. Instead, he sent us out two by two. Two by two, we have to love each other, forgive each other, endure each other, and look mercifully upon each other. Carrying a pack full of "Evangelization Tricks" allows us to think that the power to evangelize comes from us. When we build our evangelization efforts around loving our fellow disciple, we humbly acknowledge that the power comes not from us, but from Christ. When we think that Evangelization depends upon our bag of tricks, it is easy to blame the "bag of tricks" when things do not go well. When we see that evangelization begins with being faithful to the friendship of discipleship, then we see that it is our failure to love that is often the problem. Focussing too much on data, programs, planning, and skills runs the risk of turning evangelization into something impersonal. And it is this impersonal approach to Christianity that drives people away. Christianity is personal. Evangelization is personal. St. Augustine heard St. Ambrose preach. It was personal. St. Matthew heard Jesus call him. It was personal. Love is personal. Our wounds are personal. Our fears are personal. Our sorrows are personal. Our injuries are personal. Our sins are personal. This is why we need an encounter with a personal savior. How shall we encounter him? One place that we surely encounter him is in the love that is shared between his disciples. When we fail to love each other as Christians, evangelization suffers. Since the mission of the Church is to go and make disciples, it would seem that the command that we love one another is urgent. When Pope Francis urges bishops to be close to their priests or when he urges priests to be close to their people, he is doing so because this closeness is a key for the New Evangelization. Evangelization without love is just another corporation. Pope Francis is betting on love and he has good reason to do so. Jesus risked his entire plan on love. One of the holes in our evangelization efforts might be that we are focussing too much on skills and plans and too little on love and friendship. Evangelization requires charity and we all need continued education in the life of charity. It is in friendship with my fellow disciples that I learn how to evangelize because it is in friendship that I learn how to love.